Winner Bingo Review | You Have a £40 FREE Deposit Bonus Here! If you’re feeling lucky then head over to Winner Bingo and get daubing those numbers for the chance to win amazing cash prizes! The games lobby is out of this world and there’s a fantastic welcome offer to help you get started so you’ll be winning before you know it. Part of the Virtue Fusion Network, you will share a player pool with other leading brands such as Bgo Bingo and Sky, so you know you are in good company! Keep reading the review now and see if this site really turns out to be a winner! What’s going to entice you to play here more than anything else is the welcome bonus. All bingo sites offer new players a welcome bonus these days but not all of them are as big as this one. Register today then make a first deposit of £10 or more and you’ll get £40 free which will be split into two different bonuses. First up, you’ll get a £20 multivariant bingo bonus that you can stake in the Winners Win bingo rooms. You’ll also receive a £20 to use on Rainbow Riches – one of the site’s most popular slots. Not many bingo sites offer a games bonus as part of the welcome offer so you don’t want to miss out on this one! There are currently no promo codes at Winners Bingo. However, its always worth keeping your eye on the promotions tab to check if any special codes appear. The mobile revolution has reached Winner Bingo. 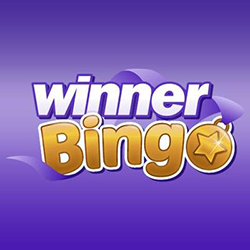 There are two ways you can play on the go – firstly, you can download the Winner Bingo app for free from Apple iTunes App and Google Play stores. Secondly, you can access the site from your mobile browser and best of all you can use the same login details to sign in from any device. Whether you download the app or access the site through the browser, as a new mobile user you’ll get a substantial welcome bonus and you’ll also be able take advantage of exclusive promotions. Powered by Playtech’s Virtue Fusion software platform you know you’re in for a real treat when you enter the games lobby. Let’s start off with bingo – there’s a range of 90 ball, 80 ball and 75 ball games spread across a variety of rooms. The tickets are reasonably priced with some of them being as little as 1p a pop so if you’re a penny pincher this site is perfect for you. The jackpots come in all shapes and sizes and you’ll see all the biggies listed on the promotions page. One of the jackpots that you’ll definitely not want to miss out on is the massive £50,000 jackpot that’s up for grabs every Friday and Saturday night from 6 pm. If it’s free bingo you’re looking for then you’re in luck because there’s a daily free bingo game where you can win up to £100. Don’t let the fun stop there! We highly recommend you check out the other tabs in the games lobby to see what else is on offer because there’s a lot more to this site than just bingo. Some of the top slots you can play at Winner Bingo include the likes of Clover Rollover, George And The Dragon, White Wizard and Big Top Tombola. Massive jackpots to play for. Wide variety of payment methods. No longer provides no deposit bonus funds. You’ll find Winner Bingo on Facebook, Twitter, Instagram and Youtube. You can withdraw as little as £5. Customer support team available between 9 am and 12 am each day. New customers only; To qualify for the welcome offer, deposit and spend £10 cash on bingo tickets and you will receive a £20 Multi variant bingo bonus (x4 wagering) and a £20 Rainbow Riches slot bonus (x30 wagering). The Multi variant bingo bonus can only be played in the Winners Win bingo room. Bonus expires 7 days after acceptance. The bonus amount can never be withdrawn. Real money balance can always be withdrawn. T&Cs apply. Winner Bingo really is a superb Virtue Fusion bingo site. Not many other brands give you the same kind of welcome offer which provides you extra funds on both bingo and slots, plus they give you access to such huge jackpot prizes. If you have played at other network sites such as Gala Bingo, Mecca Bingo or even William Hill, you will know exactly what is in store when you sign-up. If you are new to Winner we highly recommend you give them a go today!